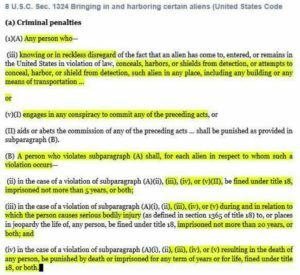 Beginning in January, I started posted questions asking why was no one talking about arresting the mayors of sanctuary cities, sheriffs, and even Governor’s of sanctuary states under the provisions of 8 United States Code Section 1324. I Tweet that question to President Trump, Attorney General Sessions, Bill O’Reilly, Shawn Hannity and Tucker Carlson. Finally, last night I heard mention of that statute when Bill O’Reilly, mentioned that he had received many messages concerning 8 USC §1324 and read the pertinent parts of the statute. He further stated that it would seem to apply and that the Administration ought to start arresting the sanctuary mayors. Then this morning I heard an interview with Sheriff Thomas Hodgson of Bristol County, MA, wherein he also called for arrest under 8 USC §1324. I am waiting for that to happen, but at least it is now a part of the national conversation. For those who do not know what I am talking about, I am again attaching part of 8 USC §1324. While, in my opinion, he should have been fired for the white genocide statement instead of just getting a reprimand, if Drexel does not fire him for this … oh well, what can you expect from most Universities and their professors in the current left wing educational climate? Last night on Fox, when asked how he can demand his right of free speech, he said that free speech included the right to disruptive protest of people with whom he disagrees. Having read his biography, it would seem that he is knowledgeable of the transformation of the 13 colonies to the United States of America and therefore the Constitution. I say this because his claim that the 1st Amendment allows disruptive protest to prevent another from exercising their 1st Amendment right to free speech. And let’s face it, many of the “disruptive” protests he is defending, like the one at his Alma Mata University of California at Berkeley were not just disruptive but violent. I hope Drexel University can understand how dangerous the statements of this associate professor are and that the summarily dismiss him. I hope other Universities will take note and refuse to hire him to indoctrinate out youth. Located in the beautiful retirement community of The Villages, FL. Since I am retired, my hours online vary, but I will respond as soon as I can to all Blogs. 73 year old Constitution Conservative who enjoys historical a political debate. Retired and just finished 12 online courses from major universities. Love to debate history, law, and just about anything else worth talking about. I try to document all of my statements by going to the source or as close to the source as I can get. I do not travel to investigate and no longer have access to some really neat investigative tools, but I think I still do a pretty good job of research. A good place to go to try to help find the truth about areas of current dispute - Is the electoral college needed; is pure democracy a good system; what is the Progressive Movement; Are Progressive philosophies the same today as during the 1st half of the 20th Century; Do we still need 50 states if we are really just one government; What is an entitlement program; is racism alive and well in America; Does Trump lie - did Obama lie - do politicians lie and why; plus any other topic you want to talk about. Part of the fun is having to do research and learning things you had no idea you didn't know!! REMEMBER, THESE ARE FRIENDLY DISCUSSIONS - WE MAY DISAGREE PASSIONATELY, WITHOUT BECOMING ENEMIES! !